For an afternoon of fun and excitement, join the sport of kings at the Garrison Savannah! It is a day for all the family. Street food, vendors, parades, picnics and mingling are as important to many as the races and the bets! The main event of the Barbados horse racing season is the Sandy Lane Gold Cup (formerly the Cockspur Gold Cup), which attracts entrants from across the Caribbean and jockeys from the United Kingdom and Canada. Stay nearby and stroll to the Garrison to enjoy race day! Swimming with the horses in the Barbados sea. This spectacle, shown in the video below, is appreciated by locals as well as tourists and visitors who spend their holidays in Barbados. Barbados Holidays of horse racing is all the more complete when you can enjoy watching the horses swim out to sea with the owners, trainers or grooms tagging along for the ride. The Garrison Savannah is one of the oldest horse racing tracks in the Americas. Racing itself in Barbados is an important part of its heritage and dates back to 1845 when the tiny Caribbean island was part of the British Empire. British officers would race against wealthy merchants and plantation owners. In those early days horses were a way of life: for getting around, for work and for play. The Garrison Savannah, a short drive outside Bridgetown, has an 11 furlong track and runs races of various lengths. 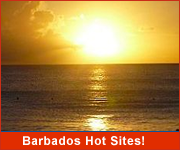 The Barbados Turf Club is the main horse racing organization on the island. The Barbados Turf Club was established in 1905 and organizes three seasons of racing on the island. A race is run most Saturdays. All sorts of people enjoy the racing at the Garrison Savannah. In addition to an international following of professional horse racers, owners, officiasl and fans, and a strong local following, more and more visitors on their Barbados Holidays are taking time out to "go to the races". 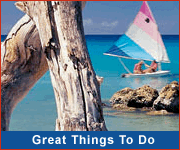 Many retuning guests plan a vacation to Barbados to coincide with particular events and races. family holidays with a go-to-the-races option are popular with all ages. This thoroughbred horse race is the most popular event of the year. It is run annually on the first Saturday in March each year. It has continued since 1982. In fact this is the most popular horse race in the Southern Caribbean and has a large international following. Spectators come from all over the world. They are rewarded with exciting races of a very high quality. International jockeys and horses owned by the world's thoroughbred racing community compete for the cup. The race is open to horses, age three or older. At 19 years old, Attie S. Joseph is the youngest person to win the race. Elizabeth Deane became the first female trainer to saddle the winning horse in 2007. Sir David Seale owns the record, 5, for the most owner wins. Sandford Prince and "Blast of a Storm" are tied at 3 each for the most wins. Blast of a Storm also holds a tie for the course record, 1:48:60 which he did twice with Thady Quill. Venice Richards and Jono Jones each have four wins as a jockey. Trainer William C. Marshall holds the most titles, 7. The Gold Cup is a festive event for the entire family. There is a Gold Cup Parade, music and stalls to get refreshments and local food. 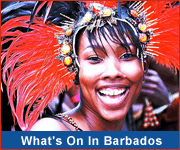 The Banks Barbados Guineas is the first leg and run in April. It is 7.8 furlongs. The Pinnacle Feeds Midsummer Creole Classic is the middle stretch with 9 furlongs and run in July. Other major and minor races take place throughout the year on the various tracks around Barbados. They include the Coolmore Trophy in January and the Victor Chandler Trophy in December. The Barbados Thoroughbred Breeders' Association sponsors a series of 5 races specifically for Barbadian bred horses each year.